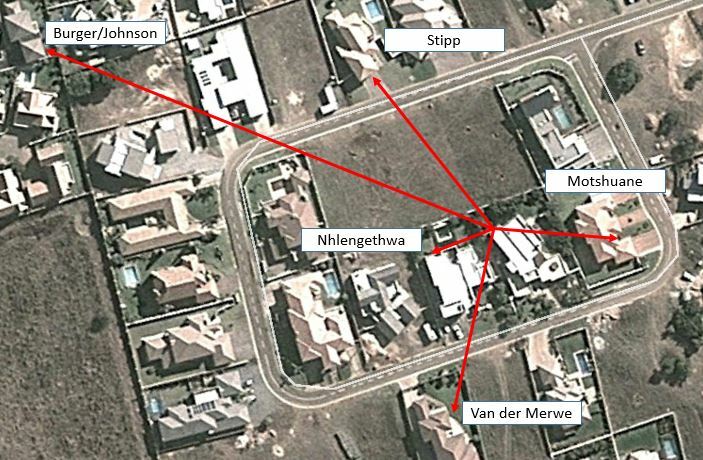 There is a common perception that the Nhlengethwas – whose bedroom window was only 25 metres away from the toilet and bathroom windows – were in the best position to hear and to interpret the screams that came from Oscar’s house. To believe this is a mistake. There is no evidence to support this. Who would have heard the screams emanating from the toilet or bathroom the best, i.e the loudest and the clearest? The Nhlengethwas or the Stipps? Could the Nhlengethwas have been wrong in that they confused a woman’s screams for a man’s crying? The Stipps slept with both their balcony doors open. The Nhlengethwas’ bedroom windows were closed and covered with horizontal wooden blinds – closed so tightly that no outside light could get in. The Stipps listened to the screams while standing outside on their balconies facing the direction of Oscar’s house. The Nhlengethwas heard the screams/cries only within the closed confines of their bedroom and only after they pulled the blinds aside to look what was going on outside. The Stipps had a perpendicular unobstructed line of sight to the toilet and bathroom windows. The Nhlengethwas had a very oblique line of sight (about 70 degrees to the perpendicular) to the toilet window that was partially obstructed by a balcony. To reach the Stipps the sounds of Reeva screaming in the toilet had to travel through one closed window and then a distance of 72 meters. To reach the Nhlengethwas the screams had to travel 25 meters through two closed windows (one of which was covered with closed wooden blinds). Irrespective of who screamed the Stipps would have heard the screams at least three times louder than the Nhlengethwas. The frequency distribution of the acoustic profile of the scream that the Nhlengethwas heard would have been significantly more “modified” than what the Stipps were exposed to. In essence a typically high pitch female scream would have sounded less like a female scream to the Nhlengethwas than to the Stipps. Even Mr Johnson would have heard the screams louder and clearer than the Nhlengethwas. The Stipps’ testimonies that they heard a woman scream before the “second sounds” at about 03:17 is conclusively corroborated by the testimonies of Mr Johnson and Mrs Burger. Mrs Motshuane does not conclusively corroborate the Nhlengethwas’ testimony. In our book we elaborate more on why we say this. Mrs Van der Merwe didn’t hear the same screams that the Nhlengethwas testified they heard. Read more here. If a mistake was made in the identification of the screaming then that mistake was much more likely made by the Nhlengethwas and not the Stipps. Why then did the court side with the Nhlengethwas?